Ah, magic! With the weather in Edinburgh taking a sudden nosedive and the threat of Fringe fatigue constantly hovering in the background, a bit of magic is surely going to help matters – and what better way to sample it than this handy package, which offers visitors a taste of five different acts every day at 4.30pm? The first guest is Tomas McCabe, who calls himself a mind reader. He brings a young woman up from the crowd and invites her to slam the flat of her hand down on a series of paper cups, one of which we are assured has a deadly metal spike hidden in it. To give the lady her due, she manages this without turning a hair, but most of the audience is holding its collective breath. Next up is Polly Hoops, who – as her name might suggest – does things with hula hoops (not the edible variety). She’s soon striding around the stage whirling several plastic hoops from various parts of her anatomy. It’s incredibly skilful and must takes hours of practice, but, I can’t help feeling, it isn’t really magic. ‘More like highly evolved PE,’ whispers Susan, and I have to agree with her. Tom Crosbie is very quick to point out that he isn’t a magician either, just a full blown nerd. Mind you, what this man can do with a Rubik’s cube is nobody’s business and it certainly looks pretty magical. At one point he manages to ‘solve’ a cube while it’s in mid air. He assures us that anybody can do this provided they put in the requisite study time, which in my case would be 24 hours a day for the rest of my life. The final act is Ben Hart and, happily, there’s no doubting this young man’s abilities in the abracadabra stakes. He performs an astonishing routine with a pack of cards, that keep getting smaller and smaller and smaller – until he’s able to blow them away in a puff of dust. He then borrows three rings from three members of the public and somehow manages to fuse them together. We have good seats near the front and I watch him like a hawk, but… no, no idea how he did that. Astonishing stuff. All of these acts can be seen in their own shows elsewhere on the Fringe and, let’s face it, we all need a little more magic in our lives. There’s no other explanation: Chris Dugdale is actually a sorcerer. He’s not a performer who’s learned a load of tricks; he can’t be, because some of what he’s doing is simply impossible. Okay, so he’s a showman and he plays along with the schtick, delivering a few crowd-pleasers that we’ve seen elsewhere and can conceive of what the trickery might be (although we still don’t know how, but we can’t have everything), but there are elements here that simply don’t make any sense – unless we accept that he’s a wizard of some sort. I mean, I don’t know how he does that stuff with the Rubik’s cubes, but I can go along with the idea that it’s a relatively simple blend of maths or dexterity – or, indeed, trick cubes of some sort. But the tiny tin of Altoids that never leaves the table… I won’t give any spoilers, but THERE’S NO WAY A MERE HUMAN CAN ACHIEVE WHAT HE DOES HERE! This is the third time we’ve seen Dugdale perform, and he gets better every time (or maybe he’s just making us think that with his mind control techniques?). This year’s show, Up Close, is much more dazzling and show-bizzy; there’s an energy and pace that has us buzzing from the start. He’s clearly enjoying himself, and his enthusiasm is infectious: the crowd is lapping up his act. We first encountered Chris Dugdale at last year’s fringe and were impressed by his show, but Full Circle is even better. Chris is a likable chap with a roguish air who has an easy rapport with his audience. He charms us, he baffles us and he sends us on our way asking each other, ‘How did he do that?’ Tricks appear to go wrong, but then he reveals that the illusion was way more complicated than we supposed. You thought we were doing this but… it was actually THIS! Cue the gasps of astonishment from everyone watching. ‘No way!’ I hear somebody whisper and I agree one hundred percent. For a final close up magic routine, Chris invites a whole bunch of us onto the stage to witness his incredible sleight of hand techniques. I watch intently, determined to spot something… anything that will give me a clue as to how he is doing these unbelievable things. But there’s nothing. He must be made of magic. There’s simply no other explanation. One hundred years ago he’d have been burned as a witch. If you see only one magic show at the fringe this year, go for Full Circle. Trust me, you won’t be disappointed. There’s something distinctly old school about magician Chris Dugdale: the sharp suit, the comic patter, the cheeky persona… and many of his tricks are well-worn too. The opening routine where he swallows razorblades was popularised by Harry Houdini, while the bullet-catch is the same one that so tragically finished the career of Chung Ling Soo (William Ellsworth Robinson) in 1918, even if Dugdale has adapted it slightly, substituting a paintball gun for a revolver. But actually it’s great to see these classic routines done with such style and aplomb. 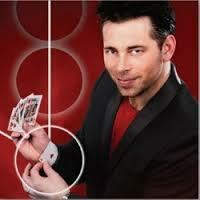 However, it’s his sleight-of-hand routines with playing cards that are (if you’ll forgive the pun) his strongest suit. These are conducted at a small table with a member of the audience sitting right beside him and a video camera projecting the whole thing onto a big screen behind. As you watch mesmerised, the cards appear to change suit every time he turns them over. It’s an accomplished piece of close up magic, one of the best I’ve seen. Another routine, which he spins out through the show has a jaw-dropping payoff as Dugdale appears to undo all traces of everything we’ve seen during his act; and there’s a ‘mind-reading’ trick that had us wracking our brains in a ‘how did he do that?’ sort of way. It’s accomplished stuff, and his invitation to play cards for money with anyone from the audience later on is wisely ignored. Maybe he might think of doing something bigger, more flamboyant next time out, but for now, this will do nicely. Oh yes, I just remembered. The trick with the Rubik’s cube. How on earth did he do that?